It seems like a lot of time has passed since Saturday morning when I saw the news that Bobby Womack had died. Apart from those parts of the weekend I spent drinking too much red wine we have been listening to his music. Most of it on vinyl. And those dozen or sides of black plastic have now distilled themselves down to one side of a greatest hits collection I picked up from somewhere I can’t now remember. The side finishes with Harry Hippie which is the song that I wanted to listen to when I first heard the news. It is a knockabout throwaway song but there is something inside it that could speak to a lot of us…. It’s the sha na lah that does it. After two days of grey sky and rain the sun has come out so we have been out in the garden. The rain had weighed everything down, plants have buckled and collapsed under it and the branches which overhang the bed that runs down the left of the garden are bowed over covering the bed in shadow. For the first time in a couple of weeks there has been time to get outside, to do some tidying up and plant a few more things for the veg patch. As I walked over the lawn I saw some strange insect crawling across the grass. Looking closer I saw that it was a baby frog no more than half an inch long. Having spotted the one the grass was suddenly alive with them and we stood still, afraid to put down our feet, for fear of standing on one of them. Hopefully a few of them will make it back to the pond next year so we can have them come visit again. In the greenhouse the one tomato plant I planted from seed is now all of two inches tall. By way of contrast the seedlings I bought from B & Q a few weeks ago are four foot tall and already starting to bud with small green fruit. The garlic I planted last year in September looks almost ready for pulling and in a few weeks time we are going to have more golden beetroot than we will know what to do with. The weather is good enough for a barbeque but I haven’t planned for that. But their is a large piece of pork marinading in quince paste and pomegranate mollasses and a bowl of chickpeas getting ready to be made into falafel. Saturday I made tomato soup and pork scratchings. The pork scratchings are very good. It was a fatty piece of pig skin that I cut up and mixed with paprika, salt, pepper, garlic and some olive oil and cooked in a low oven for a couple of hours. I am having to slap hands away from the box in which I am keeping them. Still listening to Bobby Womack. As some of you may know I will be 50 later this year. Sam Cooke died more than a half century ago, the year before I was born. Shortly before he died he recorded A Change Is Gonna Come. I am not sure if Bobby Womack played on the single but he talked about it last night. It had been warm all day and over lunch the sun had come out over the Cottage and we ate outside – although all-around there were clouds – we seemed exempt and the air over the Cottage stayed a clear blue. Late in the afternoon moving towards evening a pale low cloud came over but when you looked directly up there was still a hint of blue sky. 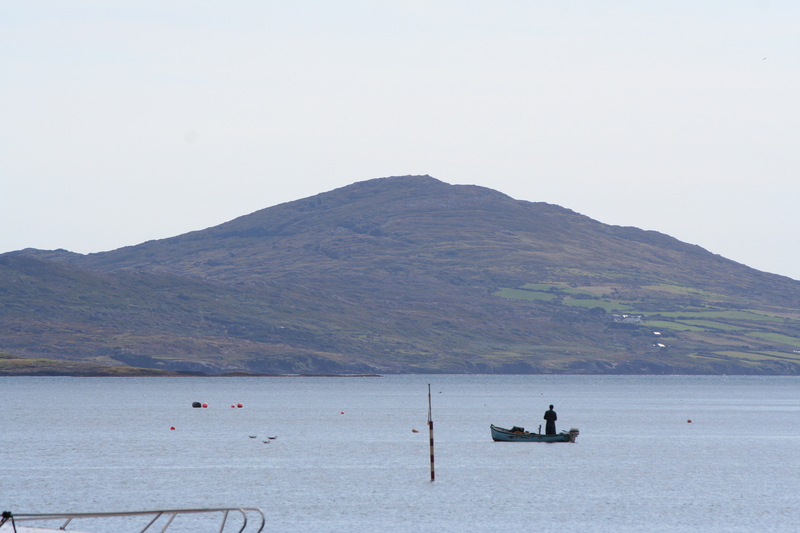 There were three boats fishing for mackerel off Owen Island on the incoming tide and a shallow golden mist had fallen over the Mizen. Having fallen it seemed to rise again. It was gold as the sun caught it adding other colours and depth so that behind Carberry Island it became impossible to tell what was cloud and what was the faint glimmer of the Mizen Head. After a few minutes it cleared so that the Mizen and its mountains rose above the line of mist floating over the water inbetween. I could see them standing in the boats as they came in, and that suggested activity in turn suggested that in the twenty or so minutes whilst the light and cloud had played over the bay mackerel had been caught.